Introduce your user and password and click Enter. You can search by author, year, title and/or journal. If you don´t find what you need, please contact us. Total publications 80. Click in every publication for more information. Camarero S, Martínez MJ, Martínez AT (2014). "Understanding lignin biodegradation for the improved utilization of plant biomass in modern biorefineries". Biofuels, Bioprod. Bioref., doi: 10.1002/bbb.1467. Wood-rotting fungi are the sole organisms in nature able to degrade the lignin polymer making the polysaccharide components of lignocellulose fully accessible. This process has been investigated for decades as a model for biotechnological application in the pulp and paper industry, animal feeding, and ethanol production. In the current lignocellulose biorefinery concept, ligninolytic fungi and the oxidoreductases (laccases and peroxidases) secreted by these fungi constitute powerful biotechnological tools for the complete utilization of plant biomass. The evolution of molecular biology, which brings into play specifically designed biological systems and on-demand enzymes, together with the technological advances in processing of plant biomass, smoothes the way for a sustainable conversion of renewable feedstocks to new added-value products, with lower energy costs and less environmental impact. The present study reviews some of the main achievements attained by our group in the field of lignin biodegradation that have contributed to: (i) better understanding of the mechanisms by which fungi delignify the lignocellulosic materials; and (ii) assessing the applicability of these ligninolytic systems to increase the efficiency of some industrial processes and to develop new means for sustainable and environmentally sound production of chemicals, materials, and fuels. Fernandez-Fueyo E, Castanera ER, Ruiz-Dueñas FJ, López-Lucendo MF, Ramírez A, Pisabarro AG, Martínez AT (2014). "Ligninolytic peroxidase gene expression by Pleurotus ostreatus: Differential regulation in lignocellulose medium and effect of temperature and pH". Fungal Gen. Biol., doi: 10.1016/j.fgb.2014.02.003. Pleurotus ostreatus is an important edible mushroom and a model lignin degrading organism, whose genome contains nine genes of ligninolytic peroxidases, characteristic of white-rot fungi. These genes encode six manganese peroxidase (MnP) and three versatile peroxidase (VP) isoenzymes. Using liquid chromatography coupled to tandem mass spectrometry, secretion of four of these peroxidase isoenzymes (VP1, VP2, MnP2 and MnP6) was confirmed when P. ostreatus grows in a lignocellulose medium at 25 ºC (three more isoenzymes were identified by only one unique peptide). Then, the effect of environmental parameters on the expression of the above nine genes was studied by reverse transcription-quantitative PCR by changing the incubation temperature and medium pH of P. ostreatus cultures pre-grown under the above conditions (using specific primers and two reference genes for result normalization). The cultures maintained at 25 ºC (without pH adjustment) provided the highest levels of peroxidase transcripts and the highest total activity on Mn2+ (a substrate of both MnP and VP) and Reactive Black 5 (a VP specific substrate). The global analysis of the expression patterns observed divides peroxidase genes into three main groups according to the level of expression at optimal conditions (vp1/mnp3 > vp2/vp3/mnp1/mnp2/mnp6 > mnp4/mnp5). Decreasing or increasing the incubation temperature (to 10 ºC or 37 ºC) and adjusting the culture pH to acidic or alkaline conditions (pH 3 and 8) generally led to downregulation of most of the peroxidase genes (and decrease of the enzymatic activity), as shown when the transcription levels were referred to those found in the cultures maintained at the initial conditions. Temperature modification produced less dramatic effects than pH modification, with most genes being downregulated during the whole 10 ºC treatment, while many of them were alternatively upregulated (often 6 h after the thermal shock) and downregulated (12 h) at 37 ºC. Interestingly, mnp4 and mnp5 were the only peroxidase genes upregulated under alkaline pH conditions. The differences in the transcription levels of the peroxidase genes when the culture temperature and pH parameters were changed suggest an adaptive expression according to environmental conditions. Finally, the intracellular proteome was analyzed, under the same conditions used in the secretomic analysis, and the protein product of the highly-transcribed gene mnp3 was detected. Therefore, it was concluded that the absence of MnP3 from the secretome of the P. ostreatus lignocellulose cultures was related to impaired secretion. Fernandez-Fueyo E, Ruiz-Dueñas FJ, Martínez AT (2014). "Engineering a fungal peroxidase that degrades lignin at very acidic pH". Biotechnology for Biofuels, 7: 114. Fernandez-Fueyo E, Ruiz-Dueñas FJ, Martínez MJ, Romero A, Hammel KE, Medrano FJ, Martínez AT (2014). "Ligninolytic peroxidase genes in the oyster mushroom genome: heterologous expression, molecular structure, catalytic and stability properties, and lignin-degrading ability". Biotechnology for Biofuels, 7: 2. Heterologous expression of the class II peroxidase genes, followed by kinetic studies, enabled their functional classification. 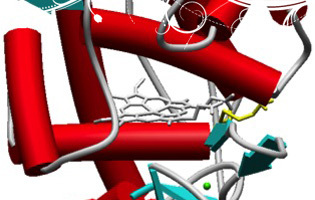 The resulting inventory revealed the absence of lignin peroxidases (LiPs) and the presence of three versatile peroxidases (VPs) and six manganese peroxidases (MnPs), the crystal structures of two of them (VP1 and MnP4) were solved at 1.0 to 1.1 Å showing significant structural differences. Gene expansion supports the importance of both peroxidase types in the white-rot lifestyle of this fungus. Using a lignin model dimer and synthetic lignin, we showed that VP is able to degrade lignin. Moreover, the dual Mn-mediated and Mn-independent activity of P. ostreatus MnPs justifies their inclusion in a new peroxidase subfamily. The availability of the whole POD repertoire enabled investigation, at a biochemical level, of the existence of duplicated genes. Differences between isoenzymes are not limited to their kinetic constants. Surprising differences in their activity T50 and residual activity at both acidic and alkaline pH were observed. Directed mutagenesis and spectroscopic/structural information were combined to explain the catalytic and stability properties of the most interesting isoenzymes, and their evolutionary history was analyzed in the context of over 200 basidiomycete peroxidase sequences. The analysis of the P. ostreatus genome shows a lignin-degrading system where the role generally played by LiP has been assumed by VP. Moreover, it enabled the first characterization of the complete set of peroxidase isoenzymes in a basidiomycete, revealing strong differences in stability properties and providing enzymes of biotechnological interest. González-Pérez D, Molina-Espeja P, García-Ruiz E, Alcalde M (2014). "Mutagenic Organized Recombination Process by Homologous In vivo Grouping (MORPHING) for directed enzyme evolution". PlosOne, 9: 3. Approaches that depend on directed evolution require reliable methods to generate DNA diversity so that mutant libraries can focus on specific target regions. We took advantage of the high frequency of homologous DNA recombination in Saccharomyces cerevisiae to develop a strategy for domain mutagenesis aimed at introducing and in vivo recombining random mutations in defined stretches of DNA. Mutagenic Organized Recombination Process by Homologous IN vivo Grouping (MORPHING) is a one-pot random mutagenic method for short protein segments that harnesses the in vivo recombination apparatus of yeast. Using this approach, libraries can be prepared with different mutational loads in DNA stretches of less than 30 amino acids, and these DNA stretches can be assembled into the remaining unaltered DNA regions in vivo with high fidelity. The combination of MORPHING with classical directed evolution and semi-rational approaches, or with neutral genetic drift, may lead to the development of new adaptive pathways to engineer more robust biocatalysts. Hofrichter M, Ullrich R (2014). "Oxidations catalyzed by fungal peroxygenases". Curr. Opin. Chem. Biol., 19: 116-125. The enzymatic oxyfunctionalization of organic molecules under physiological conditions has attracted keen interest from the chemical community. Unspecific peroxygenases (EC 1.11.2.1) secreted by fungi represent an intriguing enzyme type that selectively transfers peroxide-borne oxygen with high efficiency to diverse substrates including unactivated hydrocarbons. They are glycosylated heme-thiolate enzymes that form a separate superfamily of heme proteins. Among the catalyzed reactions are hydroxylations, epoxidations, dealkylations, oxidations of organic hetero atoms and inorganic halides as well as one-electron oxidations. The substrate spectrum of fungal peroxygenases and the product patterns show similarities both to cytochrome P450 monooxygenases and classic heme peroxidases. Given that selective oxyfunctionalizations are among the most difficult to realize chemical reactions and that respectively transformed molecules are of general importance in organic and pharmaceutical syntheses, it will be worth developing peroxygenase biocatalysts for industrial applications. Hori C, .... , Ferreira P, Ruiz-Dueñas FJ, .... , Rencoret J, Gutiérrez A, .... , Martínez AT, .... , Cullen D (2014). "Analysis of the Phlebiopsis gigantea Genome, Transcriptome and Secretome Provides Insight into Its Pioneer Colonization Strategies of Wood ". PLOS Genetics, 10: 1004759. Collectively classified as white-rot fungi, certain basidiomycetes efficiently degrade the major structural polymers of wood cell walls. A small subset of these Agaricomycetes, exemplified by Phlebiopsis gigantea, is capable of colonizing freshly exposed conifer sapwood despite its high content of extractives, which retards the establishment of other fungal species. The mechanism(s) by which P. gigantea tolerates and metabolizes resinous compounds have not been explored. Here, we report the annotated P. gigantea genome and compare profiles of its transcriptome and secretome when cultured on fresh-cut versus solvent-extracted loblolly pine wood. The P. gigantea genome contains a conventional repertoire of hydrolase genes involved in cellulose and hemicellulose degradation, whose patterns of expression were relatively unperturbed by the absence of extractives. The expression of genes typically ascribed to lignin degradation was also largely unaffected. In contrast, genes likely involved in the transformation and detoxification of wood extractives were highly induced in its presence. Their products included an ABC transporter, lipases, cytochrome P450s, glutathione S-transferase and aldehyde dehydrogenase. Other regulated genes of unknown function and several constitutively expressed genes are also likely involved in P. gigantea extractives metabolism. These results contribute to our fundamental understanding of pioneer colonization of conifer wood and provide insight into the diverse chemistries employed by fungi in carbon cycling processes. Kellner H, Luis P, Pecyna MJ, Barbi F, Kapturska D, Krüger D, Zak DR, Marmeisse R, Vandenbol M, Hofrichter M (2014). "Widespread Occurrence of Expressed Fungal Secretory Peroxidases in Forest Soils". PlosOne, 9. Fungal secretory peroxidases mediate fundamental ecological functions in the conversion and degradation of plant biomass. Many of these enzymes have strong oxidizing activities towards aromatic compounds and are involved in the degradation of plant cell wall (lignin) and humus. They comprise three major groups: class II peroxidases (including lignin peroxidase, manganese peroxidase, versatile peroxidase and generic peroxidase), dye-decolorizing peroxidases, and heme-thiolate peroxidases (e.g. unspecific/aromatic peroxygenase, chloroperoxidase). Here, we have repeatedly observed a widespread expression of all major peroxidase groups in leaf and needle litter across a range of forest ecosystems (e.g. Fagus, Picea, Acer, Quercus, and Populus spp. ), which are widespread in Europe and North America. Manganese peroxidases and unspecific peroxygenases were found expressed in all nine investigated forest sites, and dye-decolorizing peroxidases were observed in five of the nine sites, thereby indicating biological significance of these enzymes for fungal physiology and ecosystem processes. 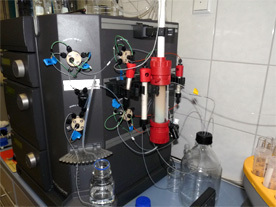 Transcripts of selected secretory peroxidase genes were also analyzed in pure cultures of several litter-decomposing species and other fungi. Using this information, we were able to match, in environmental litter samples, two manganese peroxidase sequences to Mycena galopus and Mycena epipterygia and one unspecific peroxygenase transcript to Mycena galopus, suggesting an important role of this litter- and coarse woody debris-dwelling genus in the disintegration and transformation of litter aromatics and organic matter formation. Molina-Espeja P, García-Ruiz E, González-Pérez D, Ullrich R, Hofrichter M, Alcalde M (2014). "Directed evolution of Unspecific Peroxygenase from Agrocybe aegerita". Appl. Environ. Microbiol., doi: 10.1128/AEM.00490-14. Unspecific peroxygenase (UPO) represents a new type of heme-thiolate enzyme with self-sufficient mono(per)oxygenase activity and many potential applications in organic synthesis. With a view to taking advantage of these properties, we subjected the Agrocybe aegerita UPO1 encoding gene to directed evolution in Saccharomyces cerevisiae. To promote functional expression, several different signal peptides were fused to the mature protein and the resulting products tested. Over 9,000 clones were screened using an ad-hoc dual-colorimetric assay that assessed both peroxidative and oxygen-transfer activities. After 5 generations of directed evolution combined with hybrid approaches, 9 mutations were introduced that resulted in a 3,250-fold total activity improvement with no alteration in protein stability. A breakdown between secretion and catalytic activity was performed by replacing the native signal peptide of the original parental type with that of the evolved mutant: the evolved leader increased functional expression 27-fold whereas a 18-fold improvement in kcat/Km for oxygen transfer activity was obtained. The evolved UPO1 was active and highly stable in the presence of organic co-solvents. Mutations in the hydrophobic core of the signal peptide contributed to enhance functional expression up to 8 mg/L, while catalytic efficiencies for peroxidative and oxygen transfer reactions were increased by several mutations in the vicinity of the heme-access channel. Overall, the directed evolution platform described is a valuable point of departure for the development of customized UPOs with improved features and for the study of structure-function relationships. Babot ED, del Río JC, Kalum L, Martínez AT, Gutiérrez A (2013). "Oxyfunctionalization of aliphatic compounds by a recombinant peroxygenase from Coprinopsis cinerea". Biotechnol. Bioeng., 110: 2323-2332. The goal of this study is the selective oxyfunctionalization of aliphatic compounds under mild and environmentally friendly conditions using a low-cost enzymatic biocatalyst. This could be possible taking advantage from a new peroxidase type that catalyzes monooxygenase reactions with H2 O2 as the only cosubstrate (peroxygenase). With this purpose, recombinant peroxygenase, from gene mining in the sequenced genome of Coprinopsis cinerea and heterologous expression using an industrial fungal host, is tested for the first time on aliphatic substrates. The reaction on free and esterified fatty acids and alcohols, and long-chain alkanes was followed by gas chromatography, and the different reaction products were identified by mass spectrometry. Regioselective hydroxylation of saturated/unsaturated fatty acids was observed at the ω-1 and ω-2 positions (only at the ω-2 position in myristoleic acid). Alkyl esters of fatty acids and monoglycerides were also ω-1 or ω-2 hydroxylated, but di- and tri-glycerides were not modified. Fatty alcohols yielded hydroxy derivatives at the ω-1 or ω-2 positions (diols) but also fatty acids and their hydroxy derivatives. Interestingly, the peroxygenase was able to oxyfunctionalize alkanes giving, in addition to alcohols at positions 2 or 3, dihydroxylated derivatives at both sides of the molecule. The predominance of mono- or di-hydroxylated derivatives seems related to the higher or lower proportion of acetone, respectively, in the reaction medium. The recombinant C. cinerea peroxygenase appears as a promising biocatalyst for alkane activation and production of aliphatic oxygenated derivatives, with better properties than the previously reported peroxygenase from Agrocybe aegerita, and advantages related to its recombinant nature for enzyme engineering and industrial production. Carabajal M, Kellner H, Levin L, Jehmlich N, Hofrichter M, Ullrich R (2013). "The secretome of Trametes versicolor grown on tomato juice medium and purification of the secreted oxidoreductases including a versatile peroxidase". J. Biotech., 168: 15-23. The present work was carried out with the aim to analyze the secretome of Trametes versicolor BAFC 2234 grown on tomato juice medium supplemented with copper and manganese. T. versicolor BAFC 2234 was selected among diverse wood dwelling agaricomycetes from Argentina by its ability to cause a strong white rot on hardwood and in addition to show high tolerance toward phenolic compounds. A considerable number of the identified proteins were related to the degradation/modification of lignocelluloses. Hydrolases, peroxidases and phenoloxidases were the most abundant enzymes produced under the above-mentioned culture conditions. The lignin-modifying oxidoreductases laccase, manganese peroxidase (MnP) and versatile peroxidase (VP) were successfully purified – the latter for the first time from T. versicolor. The native VP protein has a molecular mass of 45 kDa and an isoelectric point of pH 3.7. The study clearly shows that complex plant-based media being rich in phenolics, such as tomato juice, can stimulate the secretion of a broad set of extracellular lignocellulolytic enzymes. Using such natural products as fungal culture media may give the opportunity to investigate plant biomass decomposition as well as the biodegradation of organic pollutants in an environment close to nature. Hahn F, Ullrich R, Hofrichter M, Liers C (2013). "Experimental approach to follow the spatiotemporal wood degradation in fungal microcosms". Biotechnol. J., 8: 127-132. To investigate the spatiotemporal growth dynamics in fungal microcosms and to follow the spatial degradation effects of fungal lignocellulose fermentation, a new and flexible experimental setup was developed and tested. White and brown rot fungi were cultivated under solid-state conditions in beech wood-filled silicon tubes for 5 weeks. After inoculation of wood material at one end of the tube, the culture vessels were aerated and moistured by flushing air through alkaline and aqueous solutions. After incubation, the silicon tubes were harvested and segmented to follow different growth and degradation parameters. This new approach holds great potential since it allows the use of different growth substrates, variable aeration or moisturization conditions and is therefore a useful tool for diverse degradation studies, e.g. respiration/mineralization studies involving flow meters or carbon dioxide sensors or for molecular biological approaches. Karich A, Kluge M, Ullrich R, Hofrichter M (2013). "Benzene oxygenation and oxidation by the peroxygenase of Agrocybe aegerita". AMB Express, 3: 5-13. Aromatic peroxygenase (APO) is an extracellular enzyme produced by the agaric basidiomycete Agrocybe aegerita that catalyzes diverse peroxide-dependent oxyfunctionalization reactions. Here we describe the oxygenation of the unactivated aromatic ring of benzene with hydrogen peroxide as co-substrate. The optimum pH of the reaction was around 7 and it proceeded via an initial epoxide intermediate that re-aromatized in aqueous solution to form phenol. Identity of the epoxide intermediate as benzene oxide was proved by a freshly prepared authentic standard using GC-MS and LC-MS analyses. Second and third [per]oxygenation was also observed and resulted in the formation of further hydroxylation and following [per]oxidation products: hydroquinone and p-benzoquinone, catechol and o-benzoquinone as well as 1,2,4-trihydroxybenzene and hydroxy-p-benzoquinone, respectively. Using H218O2 as co-substrate and ascorbic acid as radical scavenger, inhibiting the formation of peroxidation products (e.g., p-benzoquinone), the origin of the oxygen atom incorporated into benzene or phenol was proved to be the peroxide. Apparent enzyme kinetic constants (kcat, Km) for the peroxygenation of benzene were estimated to be around 8 s-1 and 3.6 mM. These results raise the possibility that peroxygenases may be useful for enzymatic syntheses of hydroxylated benzene derivatives under mild conditions. Kluge M, Ullrich R, Scheibner K, Hofrichter M (2013). "Formation of naphthalene hydrates in the enzymatic conversion of 1,2-dihydronaphthalene by two fungal peroxygenases and subsequent naphthalene formation". J. Mol. Cat. B, doi: 10.1016/j.molcatb.2013.08.017. The formation of naphthalene hydrates (i.e. 1- and 2-hydroxy-1,2-dihydronaphthalene) displays a new activity (besides epoxidation) in the enzymatic transformation of 1,2-dihydronaphthalene by two fungal unspecific peroxygenases (UPOs) accounting for 16–19% of the overall turnover. These arene hydrates decayed into naphthalene that in turn was converted by UPOs into naphthols. The oxygen transferred during hydroxylation was shown to derive from hydrogen peroxide proving a true peroxygenation reaction. Liers C, Aranda E, Strittmatter E, Piontek K, Plattner D, Zorn H, Ullrich R, Hofrichter M (2013). "Phenol oxidation by DyP-type peroxidases in comparison to fungal and plant peroxidases". J. Mol. Cat. B, doi: 10.1016/j.molcatb.2013.09.025. Over the last years, novel peroxidases secreted by lignocellulose-degrading agaricomycetes have been discovered. Among them, the so-called DyP-type peroxidases (DyPs) that are secreted under conditions close to nature (i.e. in wood cultures) are of particular interest, since they are able to oxidize diverse substrates including veratryl alcohol, non-phenolic lignin model dimers as well as recalcitrant phenols and dyes. In spite of their unique protein structure and their catalytic versatility, the estimation of the redox potential of this new peroxidase group is still pending. To solve this problem, we used a catalytic approach developed by Ayala et al., 2007 , which is based on the Marcus equation and the determination of the redox thermodynamics between heme-peroxidase compound II and the resting state enzyme. Five fungal DyPs (among them four wild-type enzymes and one recombinant protein) were tested regarding phenol oxidation in comparison to other well-studied plant and fungal peroxidases (soybean peroxidase, SBP,Coprinopsis cinerea peroxidase, CiP, lignin peroxidase of Phanerochaete chrysosporium, LiP). DyP-type peroxidases have a high affinity for phenols and can oxidize even recalcitrant representatives such as p-nitrophenol. Based on this “phenol oxidation method”, their redox potential was estimated to range between 1.10 ± 0.02 and 1.20 ± 0.1 V, which is between the values calculated for high-redox potential LiP (1.26 ± 0.17 V) and low-redox potential, phenol-oxidizing plant (0.93 ± 0.04 V for SBP) and fungal (1.06 ± 0.07 V for CiP) peroxidases. Liers C, Pecyna MJ, Kellner H, Worrich A, Zorn H, Steffen KT, Hofrichter M, Ullrich R (2013). "Substrate oxidation by dye-decolorizing peroxidases (DyPs) from wood- and litter-degrading agaricomycetes compared to other fungal and plant heme-peroxidases". Appl. Microbiol. Biotechnol., 97: 5839-5849. Catalytic and physicochemical properties of representative fungal dye-decolorizing peroxidases (DyPs) of wood- (WRF) and litter-decomposing white-rot fungi (LDF) are summarized and compared, including one recombinant Mycetinis scorodonius DyP (rMscDyP; LDF), the wild-type Auricularia auricula-judae DyP (AauDyP; WRF), and two new DyPs secreted by the jelly fungi Exidia glandulosa (EglDyP; WRF) and Mycena epipterygia (MepDyP; LDF). Homogeneous preparations of these DyPs were obtained after different steps of fast protein liquid chromatography, and they increase the total number of characterized fungal DyP proteins to eight. The peptide sequences of AauDyP, MepDyP, and EglDyP showed highest homologies (52-56 %) to the DyPs of M. scorodonius. Five out of the eight characterized fungal DyPs were used to evaluate their catalytic properties compared to classic fungal and plant heme peroxidases, namely lignin peroxidase of Phanerochaete chrysosporium (PchLiP; WRF), versatile peroxidase of Bjerkandera adusta (BadVP; WRF), and generic peroxidases of Coprinopsis cinerea (CiP) and Glycine max (soybean peroxidase = SBP). All DyPs tested possess unique properties regarding the stability at low pH values: 50-90 % enzymatic activity remained after 4-h exposition at pH 2.5, and the oxidation of nonphenolic aromatic substrates (lignin model compounds) was optimal below pH 3. Furthermore, all DyPs efficiently oxidized recalcitrant dyes (e.g., Azure B) as well as the phenolic substrate 2,6-dimethoxyphenol. Thus, DyPs combine features of different peroxidases on the functional level and may be part of the biocatalytic system secreted by fungi for the oxidation of lignin and/or toxic aromatic compounds. Miki Y, Pogni R, Acebes S, Lucas F, Fernandez-Fueyo E, Baratto MC, Fernández MI, de los Ríos V, Ruiz-Dueñas FJ, Sinicropi A, Basosi R, Hammel KE, Guallar V, Martínez AT (2013). "Formation of a tyrosine adduct involved in lignin degradation by Trametopsis cervina lignin peroxidase: A novel peroxidase activation mechanism". Biochem. J., 452: 575-584. Lignin peroxidase (LiP) from Trametopsis cervina has an exposed catalytic tyrosine (Tyr-181)instead of the conserved tryptophan of other lignin-degrading peroxidases. Pristine LiP showed alag period in veratryl alcohol (VA) oxidation. However, LiP after turnover with H2O2/VA (VA-LiP)lacked this lag, and H2O2-pretreated LiP (H2O2-LiP) was inactive. MS analyses revealed that VALiPincludes one VA molecule covalently bound to the side-chain of Tyr-181, whereas H2O2-LiPcontains hydroxylated Tyr-181. No adduct is formed by the Y171N variant. Molecular dockingshowed that VA binding is favored by sandwich π stacking with Tyr-181 and Phe-89. EPRspectroscopy after peroxide activation of the pretreated LiPs showed other protein radicals than thetyrosine radical found in pristine LiP, which were assigned to a tyrosine/VA adduct radical in VALiPand a dihydroxyphenyalanine radical in H2O2-LiP. Both radicals are able to oxidize large lowredox-potential substrates, but H2O2-LiP is unable to oxidize high redox-potential substrates.Transient-state kinetics showed that the tyrosine/VA adduct strongly promotes (>100-fold)substrate oxidation by compound II, the rate-limiting step in catalysis. The novel activationmechanism is involved in ligninolysis, as demonstrated using lignin model substrates. This is thefirst report on autocatalytic modification, resulting in functional alteration, among class-IIperoxidases. Peter S, Karich A, Ullrich R, Gröbe G, Scheibner K, Hofrichter M (2013). "Enzymatic one-pot conversion of cyclohexane into cyclohexanone: Comparison of four fungal peroxygenases". J. Mol. Cat. B, doi: 10.1016/j.molcatb.2013.09.016. Unspecific peroxygenases (UPO; EC 1.11.2.1) represent a group of secreted heme-thiolate proteins that are capable of catalyzing the mono-oxygenation of diverse organic compounds, using only H2O2 as a co-substrate. Here we show that the four peroxygenases AaeUPO, MroUPO, rCciUPO and rNOVO catalyze the stepwise hydroxylation of cyclohexane to cyclohexanol and cyclohexanone. The catalytic efficiencies (kcat/Km) for the initial hydroxylation were in the same order of magnitude for all four peroxygenases (∼104 M−1 s−1), whereas they differed in the second step. The conversion of cyclohexanol by AaeUPO and rCciUPO was 1–2 orders of magnitude less efficient (∼102 M−1 s−1) than by MroUPO and rNOVO (∼104 M−1 s−1). The highest conversion rate in terms of H2O2 utilization was accomplished by MroUPO under repeated addition of the peroxide (87% in relation to the total products formed). Using the latter UPO, we successfully established a micro-mixing reaction device (SIMM-V2) for the oxidation of cyclohexane. As cyclohexanone is a chemical of high relevance, for example, as starting material for polymer syntheses or as organic solvent, new enzymatic production pathways for this compound are of interest to complement existing chemical and biotechnological approaches. Stable and versatile peroxygenases, as those presented here, may form a promising biocatalytic platform for the development of such enzyme-based processes. Peter S, Kinne M, Ullrich R, Kayser G, Hofrichter M (2013). "Epoxidation of linear, branched and cyclic alkenes catalyzed by unspecific peroxygenase". Enz. Microb. Technol., 52: 370-376. Unspecific peroxygenases (EC 1.11.2.1) represent a group of secreted heme-thiolate proteins that are capable of catalyzing the mono-oxygenation of diverse organic compounds, using only H2O2 as a co-substrate. Here we show that the peroxygenase secreted by the fungus Agrocybe aegerita catalyzed the oxidation of 20 different alkenes. Five branched alkenes, among them 2,3-dimethyl-2-butene and cis-2-butene, as well as propene and butadiene were epoxidized with complete regioselectivity. Longer linear alkenes with a terminal double bond (e.g. 1-octene) and cyclic alkenes (e.g. cyclohexene) were converted into the corresponding epoxides and allylic hydroxylation products; oxidation of the cyclic monoterpene limonene yielded three oxygenation products (two epoxides and an alcohol). In the case of 1-alkenes, the conversion occurred with moderate stereoselectivity, in which the preponderance for the (S)-enantiomer reached up to 72% ee for the epoxide product. The apparent Michaelis–Menten constant (Km) for the epoxidation of the model substrate 2-methyl-2-butene was 5 mM, the turnover number (kcat) 1.3 × 103 s−1 and the calculated catalytic efficiency, kcat/Km, was 2.5 × 105 M−1 s−1. As epoxides represent chemical building blocks of high relevance, new enzymatic epoxidation pathways are of interest to complement existing chemical and biotechnological approaches. Stable and versatile peroxygenases as that of A. aegerita may form a promising biocatalytic platform for the development of such enzyme-based syntheses. Piontek K, Strittmatter E, Ullrich R, Gröbe G, Pecyna MJ, Kluge M, Scheibner K, Hofrichter M, Plattner D (2013). "Structural Basis of Substrate Conversion in a New Aromatic Peroxygenase: P450 Functionality with Benefits". J. Biol. Chem., 288: 34767-34776. Aromatic peroxygenases (APOs) represent a unique oxidoreductase sub-subclass of heme proteins with peroxygenase and peroxidase activity and were thus recently assigned a distinct EC classification (EC 1.11.2.1). They catalyze, inter alia, oxyfunctionalization reactions of aromatic and aliphatic hydrocarbons with remarkable regio and stereoselectivities. Compared with cytochrome P450, APOs appear to be the choice enzymes for oxyfunctionalizations in organic synthesis due to their independence from a cellular environment and their greater chemical versatility. Here, the first two crystal structures of a heavily glycosylated fungal aromatic peroxygenase (AaeAPO) are described. They reveal different pH-dependent ligand-binding modes. We model the fitting of various substrates in AaeAPO, illustrating the way the enzyme oxygenates polycyclic aromatic hydrocarbons (PAHs). Spatial restrictions by a phenylalanine pentad in the active-site environment govern substrate specificity in AaeAPO. The impacts from the use of the novel and robust peroxidases/peroxygenases developed in PEROXICATS will concern the European Biotechnology, Bulk and Fine Chemicals (including Pharmaceuticals) sectors. The European chemical industry already maintains a top position at the world level, but during the last years it has lost its first place in the ranking to Asia (China and Japan included) according to the 2009 Annual Report of CEFIC, the European Chemical Industry Council. In organic synthesis, specific oxidation/oxygenation reactions still represent a challenging area, both in synthesis or production of bulk chemicals as in the specialties and pharmaceutical sector. As stated in an EuropaBio/ESAB report on sustainable industrial development in the EU, White Biotechnology should be one of the pillars to maintain the leading position of the chemical industry in Europe by both identifying/engineering specific enzymes for obtaining complex molecules for speciality chemicals and by improving the efficiency (rather than the novelty) of the production process. Protein purification. 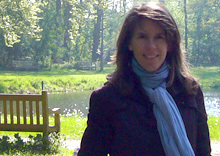 Foto: R. Ulrich. Official website of [Peroxidases as biocatalysts]. Novel and more robust fungal peroxidases as industrial biocatalysts. This project has received funding from the European Union’s Seventh Framework Programme for research, technological development and demonstration under Grant Agreement nº: KBBE-2010-4-265397. © Peroxicats 2011. Developed by Shunet. This site is optimized for the following versions and browsers: Internet Explorer 8 or higher, Firefox 3.6 or higher, Safari 5 or higher, Google Chrome 10 or higher and Opera 10.10 or higher.